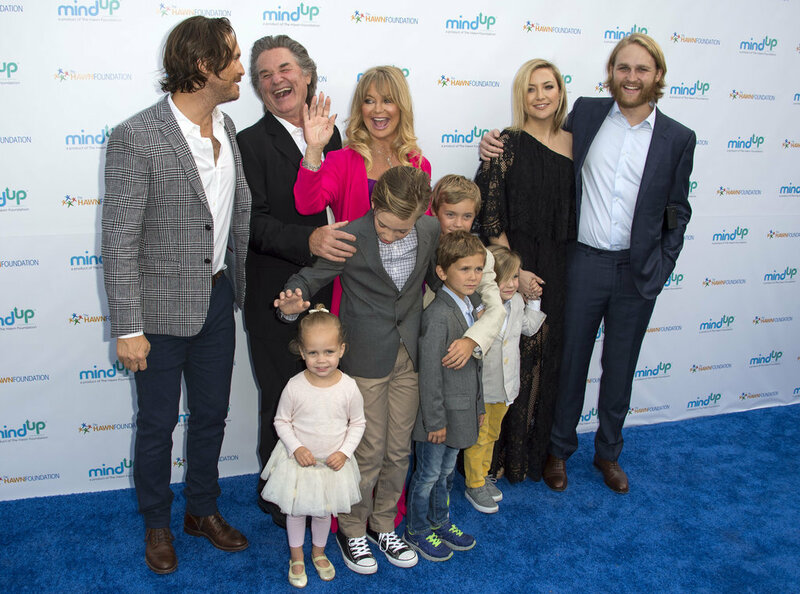 Goldie Hawn and daughter Kate Hudson attend charity with their entire family. Goldie’s annual Love in For Kids Benefit, the charity event looked more like the family gathering of Goldie Hawn. 70 years old actress Hawn, still looks as young as at her forties and she was looking gorgeous in the event with an awesome outfit of pink in a fuchsia trouser suit with a purple top underneath. Her long-time partner (since 1983) Kurt Russell embraced her in the event with a deserving kiss on a cheek. She has been previously married to Bill Hudson and Gus Trikonis. Hawn was sparkling up while walking the red carpet with her whole family. There were present her daughter Kate Hudson, sons: Oliver Hudson and Wyatt Russell and her grandchildren from Kate and Oliver. "We're going to Kate's. Everybody's kids will make things, and all the guys will be there, and then we'll all get in bed and eat." Recently, Kate attended the screening of her new movie Mother’s Day where she had the vibes of her mother Goldie. Goldie enjoyed her annual bash.